I recently hit an expat milestone! I hosted my first out of town guests who were visiting all the way from my home country, the USA. I've been blessed to catch up with friends passing through Sydney...either on a work assignment or personal holidays, but I had yet to reach that momentous occasion of having visitors who traveled just to spend time with me and my partner, Mark. 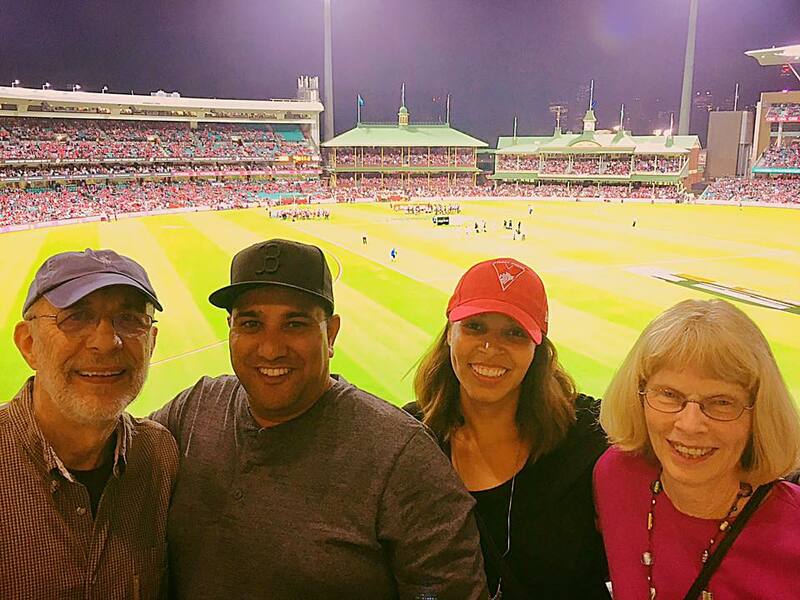 My mom and her partner, Ted visited for two weeks in April for a fun filled adventure Down Under. Neither had been to the "Lucky Country" before, so I was determined to show them a wonderful time. There is an abundance of sightseeing opportunities available in Sydney. It's quite easy to fill a two-week itinerary with activities, but it requires a delicate balance between seeing the sights and squeezing in enough time for rest and relaxation. Jet lag is a serious factor when planning a trip to Australia. It takes nearly 24 hours of air travel to reach Sydney from New York. Having made the same trip five times myself, I knew how difficult the jet lag would be for my guests. We built in time for rest on either end of the trip. Here is a rundown of the things we did over the course of the first week. We took on this activity during the first full day of my mom and Ted's visit. It was a fun, and relaxing way to explore the sights of Sydney. It also turned out to be a nice way for the out-of-towners to get acclimated with the city's layout. Details of our day are available here. Sport is a big part of Australian culture. 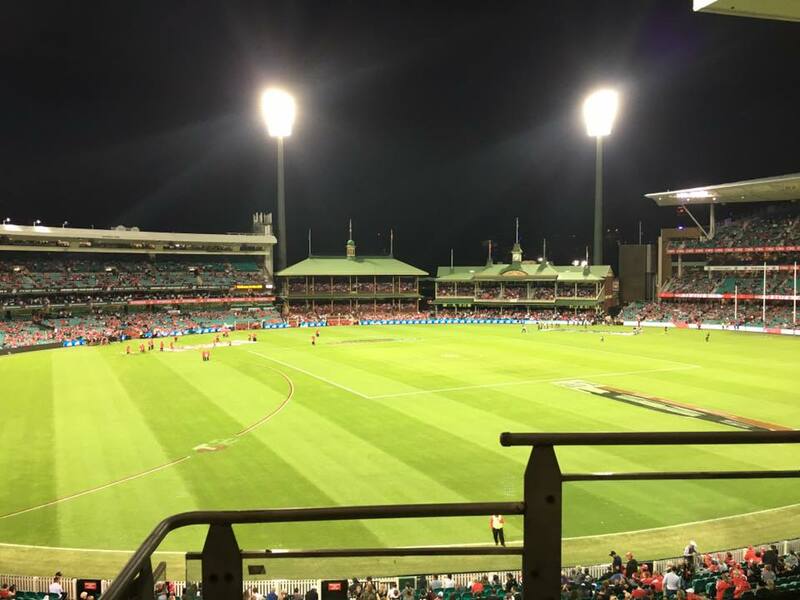 We were lucky to catch an Australian Football League (AFL) game at the SCG. The Sydney Swans (home team) hosted Collingwood, a team visiting from Melbourne. It was a beautiful evening and a great way for our visitors to view an Aussie sport live. Sydney Harbour is arguably one of the most beautiful harbours in the world. 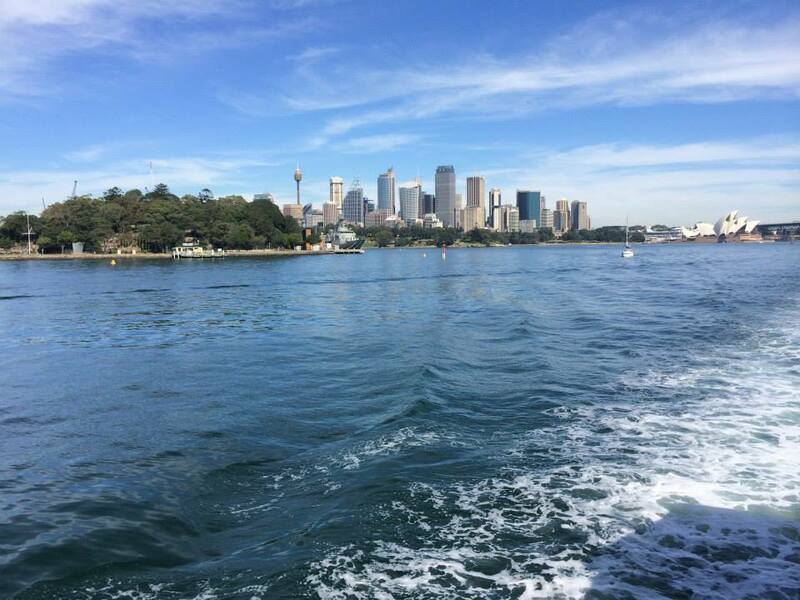 While the views are beautiful from land, there's no better way to capture the Sydney Skyline than by boat. My mom and Ted spent a Saturday exploring Circular Quay and Manly. 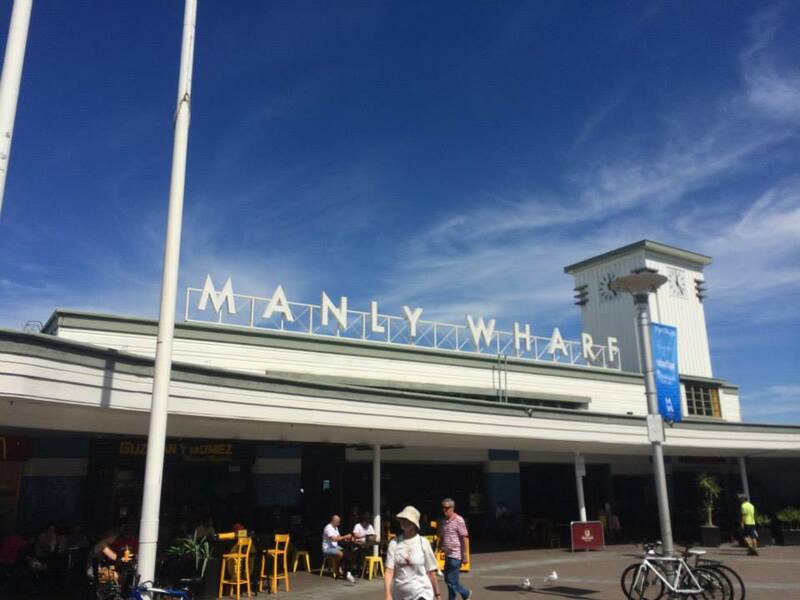 Located in the Northern Beaches, Manly is only a 30-minute ferry ride from Circular Quay. There are heaps of restaurants, shops and stunning beaches to explore. The Manly Market Place is open on weekends from 9am-5pm and a Fresh Produce Market runs on Wednesdays and Sundays from 8am-2pm. click here to view a video of the Sydney Opera House from the ferry. There is no Australian landmark more iconic than the Sydney Opera House. While exterior views are magnificent, the interior spaces are equally as stunning. The tour is worth every dollar (standard tickets are $37 per person). Tours run daily from 9am-5pm and provide visitors with a behind-the-scenes look at day-to-day operations. I was thoroughly impressed with the tour, which took approximately one hour from beginning to end. Take a look at the beautiful view from inside the Opera House. Click here to see a photo from the tour. The Museum of Contemporary Art houses Australian and international modern art. Entrance to the museum and its exhibitions is free, however special exhibitions require an entry fee. We popped into the museum following our morning tour of the Sydney Opera House and lunch in Circular Quay. The weather turned rainy, and it was the perfect way to spend our afternoon. Featherdale Wildlife Park is home to a comprehensive collection of Australian species, which include 1,700 mammals, birds and reptiles. Guests are invited to spend time with koalas in their sanctuary; feed kangaroos, wallabies, potoroos and pademelons and view live, daily feedings with dingos and Tasmanian devils. Located just an hour's drive from Sydney, this trip is well worth it! Browse through this photo gallery to see the beautiful animals. A visit to Scenic World, located in Katoomba, is an excellent way to take in the natural beauty of the Blue Mountains. We opted for the “ultimate Scenic World experience” tickets, which include unlimited “rides” on the Cableway, Railway, Skyway and Walkway for $35. Each enhanced our sightseeing journey by offering unique access points and perspectives of the landscape. Take a look at my past blog post for additional details on the Scenic World experience. The Royal Botanic Garden Sydney is located in the heart of Sydney, Australia. The garden, which opened in 1816, is the oldest scientific institution in Australia and one of the most important historic botanical institutions in the world. Access to this stunning location is free and open every day of the year. Check out my photo gallery of the beautiful views.